GOLF, TENNIS, BIKING, BOCCE, SOCIAL LIFE, COUNTY CLUB LIVING! Single family boasting vaulted ceilings and a great room open floor plan. 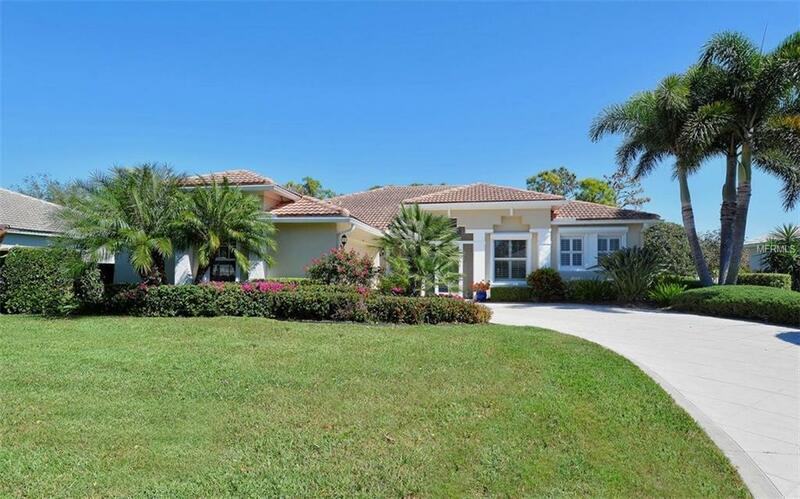 With 3 bedrooms, a den/office and 2 full baths (master recently completely upgraded with new tile, cabinetry and a wheel-chair accessible oversized shower), theres a screen enclosed entry way, gorgeous sweeping golf course views and a heated pool and spa (03) surrounded by tasteful stone pavers. Electric hurricane shutters ($20,000+) on all windows and doors, great for those stormy days and extra privacy and even safety when desired. This homes already excellent curb appeal (nestled within higher priced homes) is further enhanced by a side entry 2 car garage. The spacious master bedroom has a volume ceiling, plenty of closet space & crown molding. Sliders and double windows overlook the lanai and bathe the room with sunshine, highlighting the wonderful pool & golf course views. The vaulted ceiling kitchen has lots of cabinet and counter space, a breakfast bar and dinette area with sliders to the lanai. BUY A HOME ANYWHERE...BUY A LIFESTYLE IN STONEYBROOK!! !